Greetings, from the Wittelsbachs’ winter palace in Munich, commonly known as The Residenz. It was here that my family ruled for 700 years– longer than any in European history. 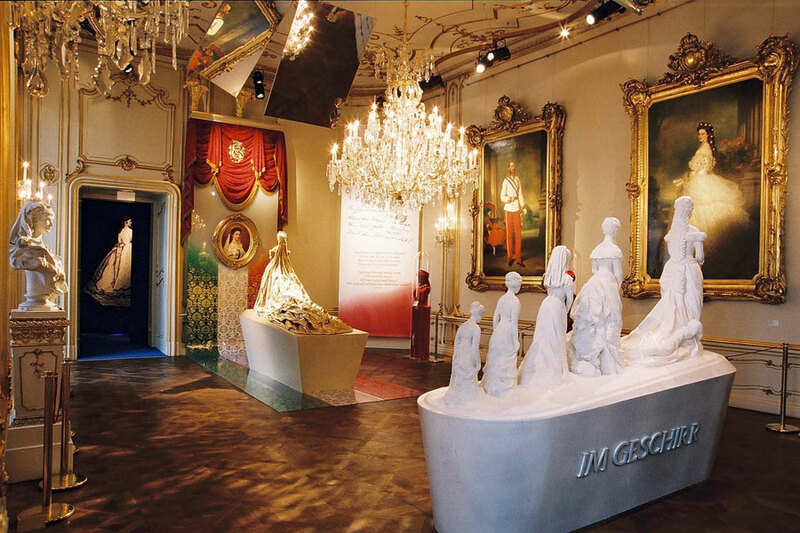 If you’re a fan of rococo and baroque and all manner of gilded grandeur, you’ve found the right place! Here, you’ll find relics spanning the 14th to 19th centuries. Everything from pre-Christian mermaid’s breasts to the Neoclassic canopies favored by the latter-day Wittelsbachs (who preferred comfort over ornate gloom). 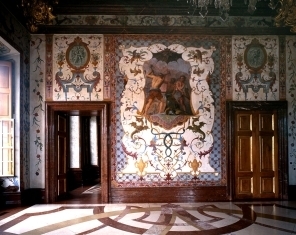 The photo above is of one of the most precious rooms at the Residenz. 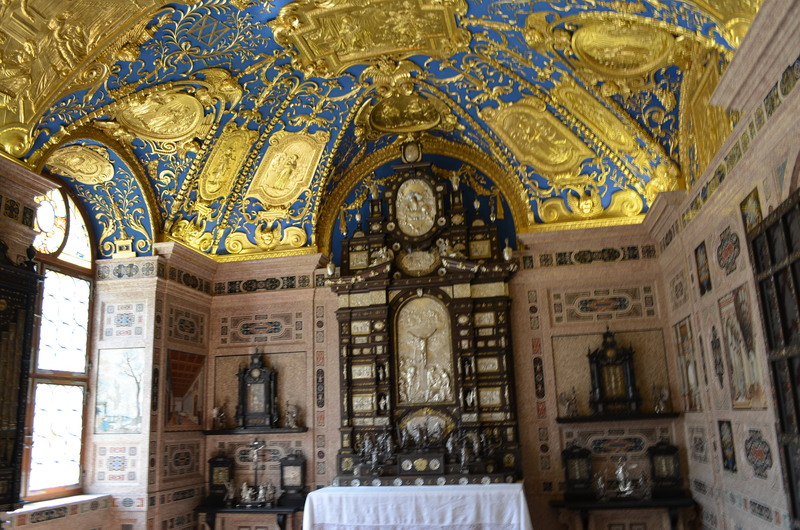 The Private Chapel of Maximilian I. 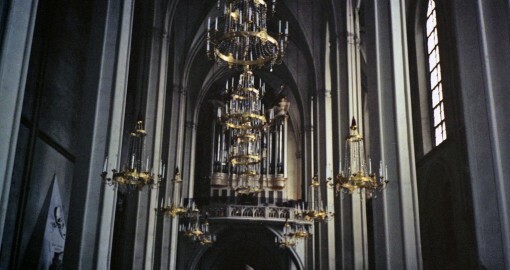 The chapel is smothered in gold leaf and culiques, and includes a working pipe organ dating from the 16th-century, as well as stucco marble paintings on the walls, (below). Want to walk a kilometer in my slippers? Well, you’re in luck! 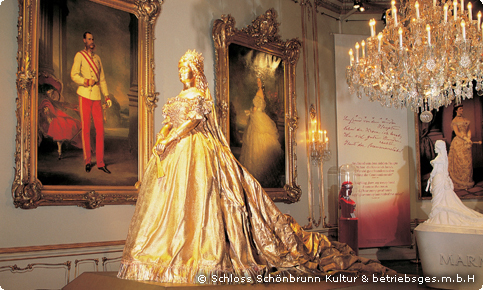 The Schoenbrunn Orangery offers a splendid tour called “Sisi’s Treasures,” where you may experience imperial Vienna through the eyes of the legendary Empress Elisabeth, aka, me. For a mere 150 Euros you get the essence of life as, well, if not me, at least one of my servants. Your tour begins at one of my castles (Schoenbrunn or the Hofburg), where you can marvel at my exercise equipment, ridiculously uncomfortable chairs, spectacularly formal silverware, and the minutia of my everyday life: hairbrushes, chamber pots, pen nibs. After all of that touring, you’ll be treated to a 3-course dinner at the Café-Restaurant Residenz (bring a sweetheart–there’s candles and ambience. Alcohol in abundance for an extra charge), and then, to top off your evening, you’ll attend a concert at the Orangery, performed by the Schoenbrunn Orchestra. It’s an explosion of all things Viennese! If the above has you thinking: enough already with the Empress for a Day stuff you can always opt for the Mammals and Melodies Tour–in lieu of my castles, silver and underwear, you get a trip to the Vienna zoo as well as a beef in aspic dinner (that includes a shot of Swiss Pine schnapps!) and the Orangery concert described above. A castle fit for God himself. It’s no secret that I adored my cousin, Ludwig II. Like me, he was shy. A dreamer with a big heart and a need to follow his vision. As a child he would build these fantastic block castles, and I, seven years his senior, would flop down on the floor beside him and together we invented the most marvelous adventures. When he became king (at the mere age of 18), he was truly clueless. His whole life he’d spent in the company of women – enjoying “dress up” and making little skits. He had no idea how to rule, so he appointed various politicians to do all that boring stuff, and set to his true work: building a fairy tale castle. Ludwig based the design of the “New Hohenschwangau Castle” on Christian kingship in the Middle Ages, and the new Versailles, recalling the aesthetic preferences the Bourbon King of France in its baroque-ness. 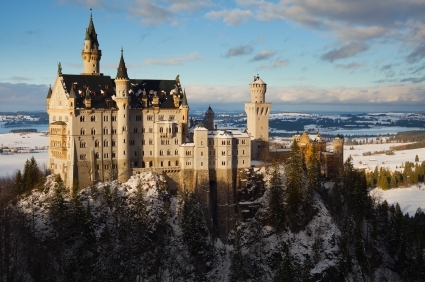 The ultimate Nueschwanstein Castle was also inspired by the operas of Richard Wagner (whom he idolized and patronized–to the point of dedication of this very castle). 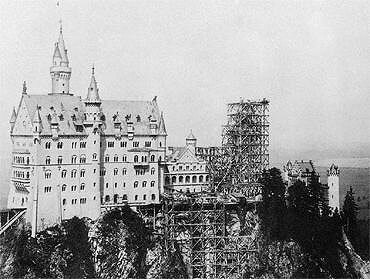 This is what the castle looked like when Ludwig died. But, alas, my dear cousin never did get to see his fairy tale castle fully unveiled, as he died tragically before its completion. Another crazy genius, leaving the world a more interesting place than he found it. Once upon a time there was an imperial palace perched at the edge of the Wienerwald. Now, it’s a hotel of the four star variety nestled among the best mansions in Vienna. What happened toward the end of the 19th century is the important part of this story, because it involves love, jealousy, and my favorite topic: dysfunctional family shenanigans. 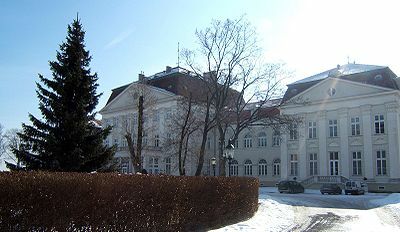 In 1780 Prince Dmitri Mikhailovich Galitzin, the Russian ambassador in Vienna, acquired forested real estate from Count Franz Moritz von Lacy. He ordered a small Jagdschloss erected which soon became famous for its social events. By 1824, when the building was already in disrepair, ownership of the estate had passed on to Duke Julius de Montléart (of French nobility) and his wife Maria Christine. Now, if you know anything about this time period, you know that France and Austria were not always buddy-buddy, however, they shared a love of hunting and rich food. 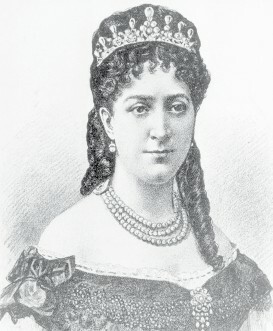 When Julius’ son, Duke Moritz de Montléart, acquired the property after considerable legal battles (read: jealous family members) he gave it to his wife Wilhelmine, and named the castle “Wilhelminenberg,” hoping that the whole town would also be named after his beloved wife, but the townspeople were used to living in a town called Galitzinberg, so they put the kibosh to that plan. As you know, the Viennese are not big on change. Upon the death of the Duke and his Frau in 1887 and 1895 respectively, both were interred in a small mausoleum which was built in the same “neo-gothic” style as the Schloss, and was erected close to the castle. Because of her generosity towards the poor, Wilhelmine Montléart was ultimately remembered as the “Angel of Wilhelminenberg,” but it took awhile. If for no other reason, you should visit this castle to learn more about Wilhelmine. She was a good egg. Breakfast fit for an Empress. 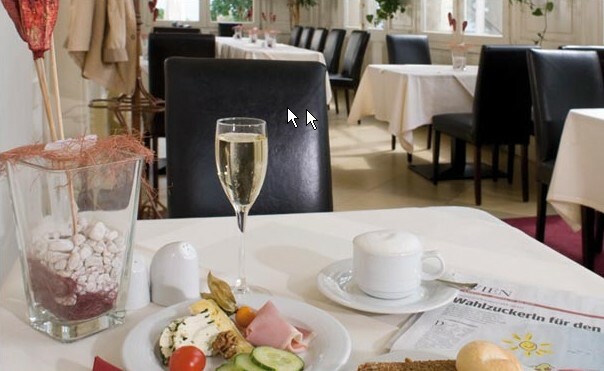 And, speaking of eggs, if you visit Vienna these days, you can stay here as a guest! Though it’s a bit on the pricey side and currently booked until next fall, I hear that the breakfasts of sausage, duck eggs and veal cutlets (taken under fancy crystal chandeliers and eaten with heirloom cutlery) alone are worth it. Shoot them an email and see if you can get in. Tell them Sisi sent you. The garden palace primarily served the purpose of pomp and display. This is reflected in the elegant sala terrena (today the entrance hall), the grand staircase, the magnificent Marble Hall, rooms sumptuously embellished with stucco and frescos (frescos by Carlo Carlone [1686-1775], ceiling paintings by Giacomo del Pò) and the chapel with the exquisite altarpiece by Francesco Solimena (1657-1747). 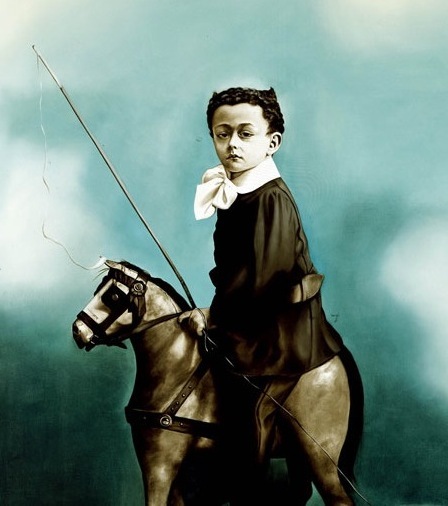 The Marianna Gartner masterpiece, "Bad Friederich" reminds of my own little Rudolph! But the grandest thing about the Upper Belvedere? it is THE place to go for the latest in risky art. 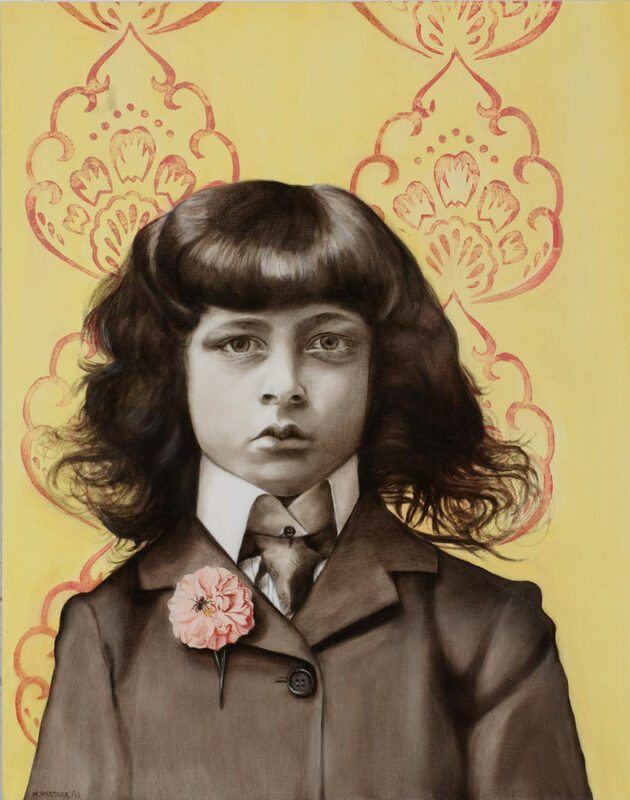 From Klimt to Schiele to Kokoschka, the art at Belvy will make you deliciously uncomfortable (even more than the hard marble pathways and lack of seating in the palace). If you are planning on a trip to Vienna this fall, you simply must check out the exhibit called Interventions featuring incredible work by Marianna Gartner. 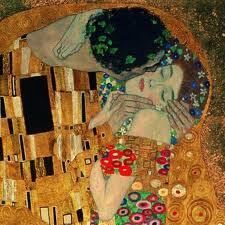 If I were alive, I’d love to see how Marianna would have painted me. In particular, if her interpretation would have included that haunting Viennese stare, like with “long haired boy” to the left. Would she embellish my vanity by painting diamonds into my ankle-length tresses? Would my waist be cinched with ship-docking chain? Oh, but Marianna would have had a field day with my exercise apparatuses! I truly appreciate the burgeoning irony in the Austrian character, and what better place to foist it on the public than in the ostentatious baroque halls of the Upper Belvedere? One cannot consider the Lower Belvedere without immediately conjuring Prince Eugene of Savoy, he of minimal stature and ginormous ego. In the late 17th century, Eugene fled France (where he was rejected by the Army due to his height) to Austria and began slicing and dicing his way to fame and fortune: slashing Turks, igniting the Spanish Succession, and leading charges up and down the continent. Eugene made up for his shortness with the size of his balls, and goes down in history as the fiercest fighter ever for the Austrian Army. Lower Belvy’s ostentatious gold and marble rooms are a direct reflection of the Prince’s, um, short comings. Most importantly, his zealous drive to win made way for the success of the Habsburg dynasty, and, more concretely, this ridiculously fancy castle, bought by Maria Teresa in 1752 out of pride (NOBODY looks down on the Hof, and the Upper and Lower castles were an affront to MT–though legend has it that she never even set foot in the place) remains one of Vienna’s hottest properties on the tourism circuit. Vienna loves its freaks almost as much as ice cafe! 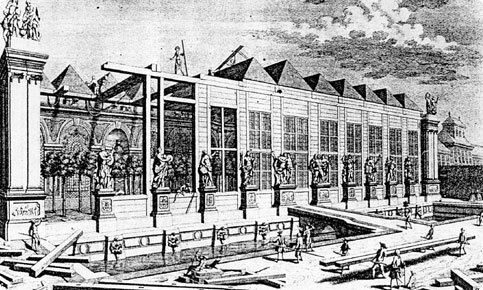 The baroque summer castle is famous for such attractions as the Marble Hall, adorned with art by Martino Altomonte, the state bedroom where Eugene committed all matter of hijinks, the orangery, which is currently jammed with Medieval Art, the palace stables, and my personal favorite, the Hall of Grotesques. The so-called Groteskensaal represents Austria’s ongoing fascination and repulsion for all things freakish. Here you’ll see nightmarish gargoyles and bizarre paintings inspired by Roman frescoes. As decorative as it is dark, The Lower Belvedere gets my vote for perfect Viennese metaphor. The Sisi Museum. Quite an homage, if I do say so myself. Moving right along, let us now dive into the deep end. Dessert before vegetables: The most Imperial of all Habsburg Palaces, The Hof. Crown jewel of Vienna, The Hofburg was home to six generations of Habsburg royalty, including, by marriage, yours truly. Opulent and oppressive in every way, even naysayers must admit, the place is an impressive collection of all that glitters. Not only does the palace boast the Gothic Royal Chapel, where the sweet voices of the Vienna Boy’s Choir charm visitors seven months a year, but it is home to a collection of national treasures so vast, it would make a dead empress blush. Okay, forget the fact that the fancy Neue Burg was the chosen spot for Hitler to announce his Anschluss, as palaces go, it has a pretty impressive entrance. Ah, but that’s the so-called “new palace.” And it does not hold a platinum candlestick to the Imperial Apartments of the Hof proper. Those fancy rooms, where I spent many a day fanatically exercising and scheming my next exotic rest cure, brim with porcelain, silver, portraits and tapestries. And, of course, this is where one can spend hours in the Sisi Museum, where I’ve been immortalized as a tragic figure. Lastly, if you have time, you must scurry over to the Treasury and take in the embarrassingly extensive collection of jewels. If you are a fan of excess, you are in the right place. And, the 8 Euro admission fee is a deal, where else can you see a 500-year-old unicorn horn?! I have decided to bow to expectation (and if you know me, you know how hard this is for me), and unveil some of the lesser known aspects of the ever-popular castles of Vienna. There are five of renown: Schönbrunn Palace, Hofburg Palace, Lower Belvedere, Upper Belvedere, and Schloss Wilhelminenberg. 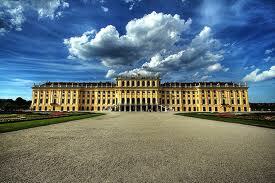 Today we will tour Schönbrunn. Opulent homage to Maria Theresa, but originally built for Emperor Leopold I, this is where we spent much of our summers. How many rooms do you think in this Imperial cottage? Go ahead, take a guess. Nope, not even close. 1400 you say? Ding, ding, ding! Schönbrunn is the well-known mother ship of the famous Palace Theater where Joseph Haydn and Wolfgang Amadeus Mozart played. Remember the movie Amadeus? The Palace Theater is where Mozart lost a contest for composers to his arch rival Salieri. i pledged my heart to the emperor in this very place. fitting, given that St. Augustine's is also called the habsburg heart crypt. 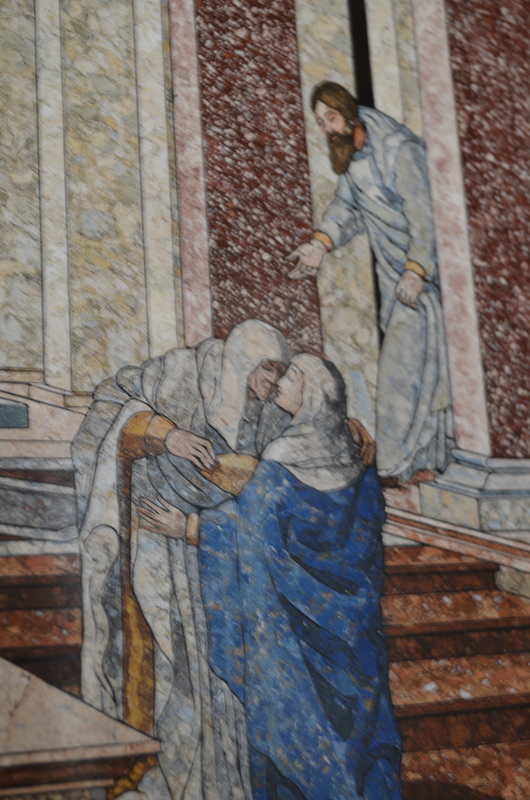 I married the Emperor in St. Augustine’s Church, another Schönbrunn feature. Perhaps my ambivalence on my wedding day has something to do with the fact that this church is also home to the exhumed Habsburg’s hearts? I don’t know. Just a thought. As for the zoo, that is a sad memory for me. I bought a little macaque to entertain my daughter Valerie, but the ladies-in-waiting became quickly aghast due to its, um, indecorous obsession with its private parts, and it was then banished to the zoo. I could never bear to see animals behind bars, so, like a PETA member of yore, I boycotted the very institution. That said, I should admit that I do have a prickly fondness for Schönbrunn on the whole. If for no other reason than, with 1400 rooms, I had ample space to hide from certain members of my family. All in all, if you have funds for one castle tour only, I suggest Schönbrunn without reservation. I mean with all those rooms embellished with gold leaf, the gardens, even the blasted zoo, you are getting quite a hit of Vienna!